Am shooting a video for my song FREEDOM in BIDIBIDI one million camp in Uganda and i happened to take a pic with this beautiful mama and handsome man with marks on their faces. Many people have tattoos for reasons of beauty and pride, but today, I have decided I will mark my face in support of PEACE AND FREEDOM in SOUTH SUDAN. I understand clearly that it’s a painful procedure as the mama spoke to me in fluent English, that’s why am doing it to share the pain with my neighbor and support PEACE in SOUTH SUDAN. Thank you Uganda for being good. Maybe when Bebe Cool marks his face, it could become a national campaign, and spread word about the refugees from South Sudan. Note that BidiBidi is the largest, if not the second largest refugee camp hosting South Sudanese refugees in the world today. 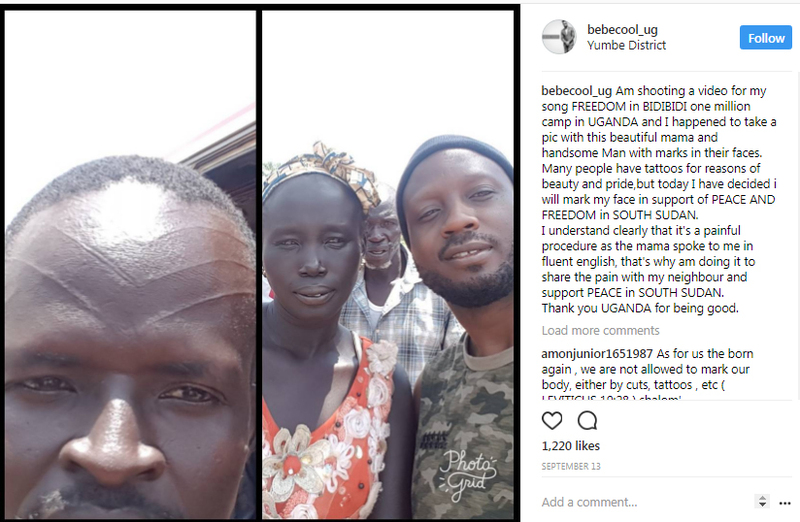 The post Bebe Cool says that he will mark his face to support peace and freedom in South Sudan appeared first on Hot in Juba.